Stella Arnaldo's Blogspot: I leave the house and all hell breaks loose! I WAS out the entire day covering a story and was virtually shut off from the world bec. the building I was in was super cyber-secure. It was so secure, I couldn't even use the free wifi next door at the Robinsons Cybergate nor use the Internet access on my own cellphone. So imagine when I got home and found this! 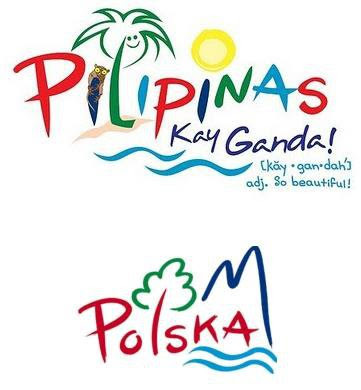 A check with the official travel website of Poland showed that indeed, their logo has a striking similarity to "Pilipinas Kay Ganda," from the font, the colors, and even the use of a tree (well, granted, that of the Philippines is a coconut tree, while that of Poland is, well, a generic tree).